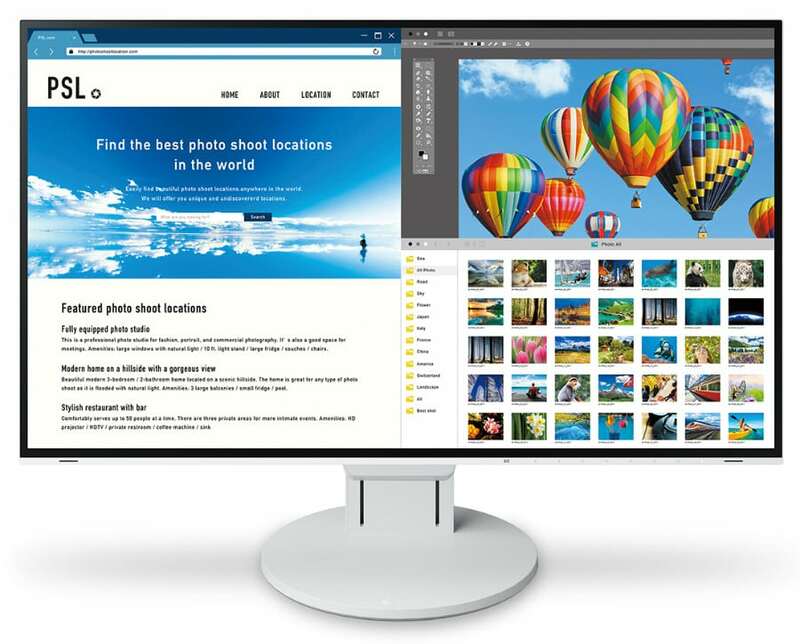 UPDATED 2019: The Eizo FlexScan EV2785 is a sophisticated premium monitor designed for offices and studios who require a reliable and high-quality display for everyday tasks. The monitor offers advanced features such as USB-C connectivity and an add-on called Auto EcoView for round the clock comfort and eye safety. The Eizo FlexScan EV2785 is too expensive as a typical office display, but let’s check out its capabilities which should justify why companies and executives should use it. The EIZO FlexScan EV2785 features a futuristic design composed of a bezel-free face and a space-age design concept which is one of the best we have seen. The front is surrounded by a 1mm outer bezel and 6mm black panel borders which do not overlap the surface, giving the monitor the infinity edge look. Buyers will get to choose between a matte black or white exterior both of which are attractive for upscale homes or sophisticated offices. The EIZO FlexScan EV2785 emphasizes on reliability, so it’s built with the best manufacturing quality we have come across. The plastic panels feel thick and sturdy while the monitor’s parts do not show any gaps or manufacturing defects. The stand can hold the heft of the chassis with ease, so the device doesn’t wobble or stand crooked. The frame is quite thin by modern standards, while the circular base, although less ideal, doesn’t take up a lot of desk space. The total weight of eighteen pounds is reasonable, but it’s considerably heavier than some that we have tested due to the materials used. The EIZO FlexScan EV2785’s physical feature that we like the least is the electrostatic buttons on the lower edge of the screen. Each one is responsive as soon as you touch them, but this kind of setup can get confusing. For any monitor, we still prefer joysticks since it’s much more convenient and tactile. The class-leading stand included in the package for the EIZO FlexScan EV2785 involves the broadest range of flexibility we have seen in the monitor business. You have 7 inches of travel for height adjustments, 40 degrees of tilt, 340 degrees of swivel, plus you can pivot the screen. And since the face is bezel-free, this set of ergonomics should allow easy configuration for multi-monitor setups. The unique upright which looks sturdier than most also includes a hanger or a mini PC for that all-in-one look. 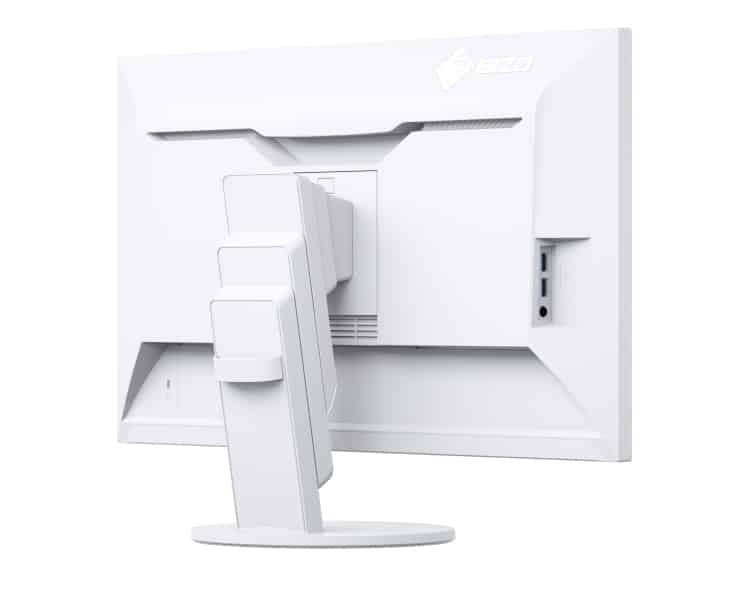 EIZO emphasizes on neatness and a streamlined desktop environment for the EIZO FlexScan EV2785 since the monitor is aimed at studios and businesses. Of course, you can still opt to remove this functional piece in favor of VESA mounting, although we can’t imagine why anyone would find the need to do so. Since the EIZO FlexScan EV2785 is a display built for productivity, it includes a well-equipped I/O layout which even has a plastic cover. Ports included are DisplayPort 1.2, two HDMI 2.0 slots, and a USB-C connector with 60 Watts of power for laptop docking. There is also a pair of built-in speakers with 1 watt each, plus a USB 3.1 hub with a 3.5mm headphone jack on the side of the bulge. It’s worth noting that using the USB-C slot for video input and charging will slow down the USB 3.0 slots to 2.0 speeds. You can still operate them at 3.0 standards even when a laptop is connected, but the screen will function at 30Hz 4K instead of the desirable 60. 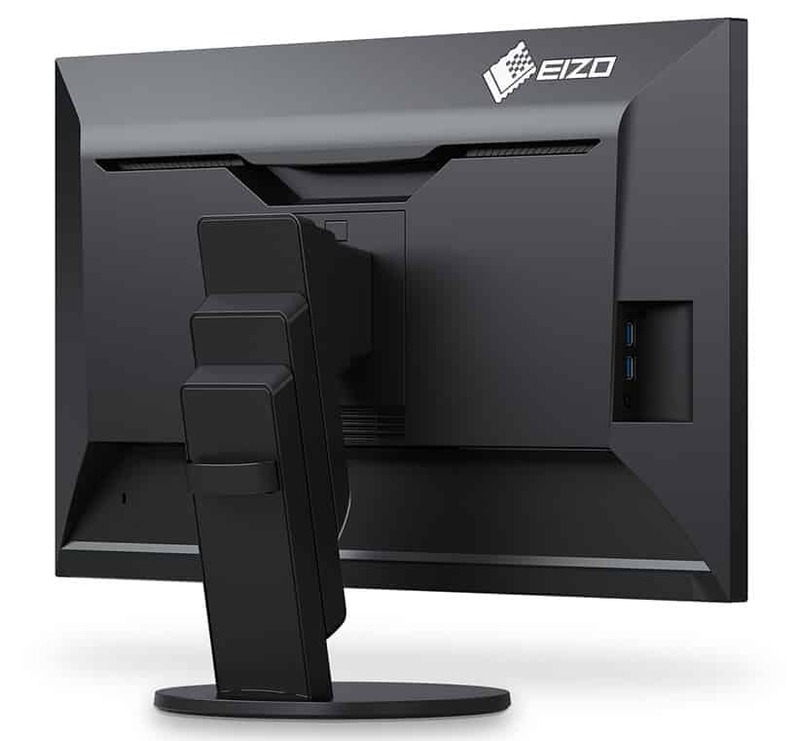 The the EIZO FlexScan EV2785 also includes built-in speakers with 3.5mm audio jacks to match. This feature completes the device’s position as an attractive solution for offices. But to be honest, we wish Eizo included more easily accessible slots than this item. The EIZO FlexScan EV2785 features a 27-inch IPS panel with a 3840 x 2160 resolution, 60Hz refresh rate, and 5ms response time. Brightness is specified at 350cd/m2 while the contrast ratio is advertised at 1300:1, indicating that this model isn’t HDR capable. The screen has an 8-bit interface, so the screen is limited to sRGB gamut coverage. As mentioned, this is the first 27-inch 4K monitor from the company, since most of the FlexScan monitors come in either 1440p or 1080p. UHD at this size equates to a pixel density of 163 PPI, ensuring images are crisp and highly detailed. One downside to this aspect is that some might struggle at reading and viewing smaller objects since software scaling doesn’t always work correctly. Eizo made good use of the broader view real estate by adding a Picture by Picture mode which displays multiple sources side by side. This is especially useful for power users such as traders or designers who require a larger work area for productivity. The Eizo FlexScan EV2785’s IPS panels produce gorgeous images right out of the box thanks to its 99% sRGB coverage with a default accuracy of Delta E 1.76. The screen is very neutral thanks to minimal grayscale errors and a slightly warm color temperature. The screen doesn’t need calibration, so it’s perfect for office use which does not see colorimeters that often. The backlight on the Eizo FlexScan EV2785 is also immensely powerful, putting out as much as 497 cd/2 of brightness. Adjusting this setting feels responsive and refined, so most users will be happy with this model. The contrast ratio misses the specified amount at 1080:1, but that score is already fantastic for an IPS panel. You won’t need to tinker with the Eizo FlexScan EV2785’s settings since even its gamma is almost perfect at 2.23. You do, however, have to work with the brightness settings to get the EcoView feature to work. The add-on functions by remembering your desired brightness level depending on the room’s ambient light and sets it once the sensor detects identical instances. Panel uniformity isn’t an issue for the Eizo FlexScan EV2785 sample since most of the quadrants looked evenly lit. There is a little deviance in color uniformity of about DE .1 on the bottom of the screen compared to the top, but its unnoticeable, even for some trained set of eyes. Of course, this aspect could vary between unit to unit, but Eizo has not disappointed QC-wise. Another functionality we love on the Eizo FlexScan EV2785 other than the Auto EcoView capability is the Screen InStyle add on. This app allows users to configure the monitor’s settings in Windows so manipulating the OSD need not go through the touch buttons. This also doubles as an admin tool which lets a central unit set multiple EV2785s in a single network . The Eizo FlexScan EV2785 handles motion decently so it has some use for casual gaming. Blurs will still be visible for most users, so its adviced to use the optimal level of the device’s Overdrive function. Setting it too high will induce massive amounts of overshoot which could ruin your visual experience. Unfortunately, there are no gaming features such as FreeSync on the Eizo FlexScan EV2785 which is designed for enterprise or business use. Input lag is too high at 35ms, so avid players need to look to other options for their needs. For casual purposes this monitor still could work, but there are cheaper and similarly capable monitors in the market now. The Eizo FlexScan EV2785 is a fantastically designed business monitor with quality and functionality at the heart of its being. The IPS panel is vibrant and accurate right out of the box, so users only need to tinker with the brightness for comfortable use. The product’s unique tools such as EcoView and InStyle are fantastic at what they do to make your computing life more manageable. The only issue we see on the Eizo FlexScan EV2785 is its slow performance in responsiveness and latency. The screen can handle motion decently, but there is a noticeable delay compared to the 4K gaming monitors we’ve reviewed. But then again, that’s forgivable for a business monitor whose pricing goes to superb quality and great functionality. i have an AMD Radeon R9 M370X in a macbook pro i7 16GB ram (mid 2015) but some day i will have a desktop. 1. I want to set it to 75 Hz so its better for games. Can it be done with safety? Hi, Thomas! We don’t think you can overclock the Eizo 2785 4K to 75Hz without trying and damaging it. It’s not worth risking a one-grand product just to get an additional 15Hz. Input lag averages at 35ms, which is a bit high for gaming. Cheers!